I feel like it’s time I come clean and tell you that I have a napkin obsession. It’s a bit of a problem, really. We have cabinets full of them because you never know when you might need some pink and gold twine linens for a dinner party! Ya feel me? I have had a bunch of solid dinner napkins for years and finally thought I’d do something about it. 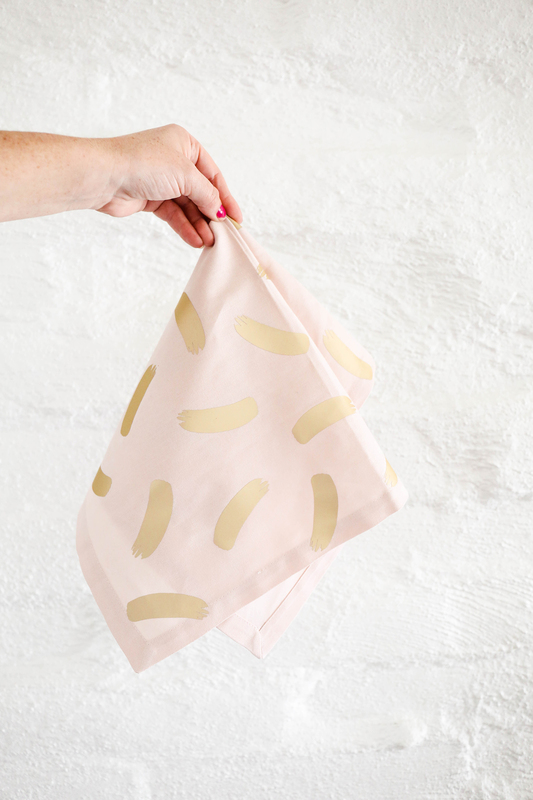 Whenever I make printables, I have a folder of fave shapes and a few looked like paint strokes and figured they would be perfect for some DIY abstract napkins! I broke out my Cricut EasyPress 2 and got to work! I’m a sucker for easy iron-on projects and this one came together in less than 30 minutes and makes a perfect gift for your pals at your annual Galentine’s Dinner! After editing my shapes in Cricut’s Design Space, I had them cut quickly using my Maker. Once they were cut, I simply weeded the excess material off of the liner before applying everything to my napkins. Now, I am new to the magic that is the EasyPress 2. In the past, I’ve always just used an iron for my iron-on projects. That is just fine, but can be tricky because you can’t control the heat as specifically. Not to mention the small amount of coverage you actually get with an iron so your heat isn’t dispersed evenly. The EasyPress 2 comes in a few different sizes to allow you more coverage based on the project you’re working on. It also comes with a stand that you can place the hot press on and not worry about any burns or anything melting. I used the EasyPress 2 to press any wrinkles out of my linens before getting started. That alone told me this was totally worth it. I have used the hottest setting on my iron for my napkin wrinkles and they NEVER disappeared before now. The EasyPress 2 can get SO hot, my friends, and it smoothed out any imperfections prior to me adding the design. I played around with the layout and wanted this one to be pretty saturated with shapes. With the shiny side up, I moved things around until it looked just right. You can raise or lower the temp based on the material you are ironing on, and there is a timer to let you know when you can press and when you are done. It’s almost fool-proof. Lexy-proof, if we’re being honest. 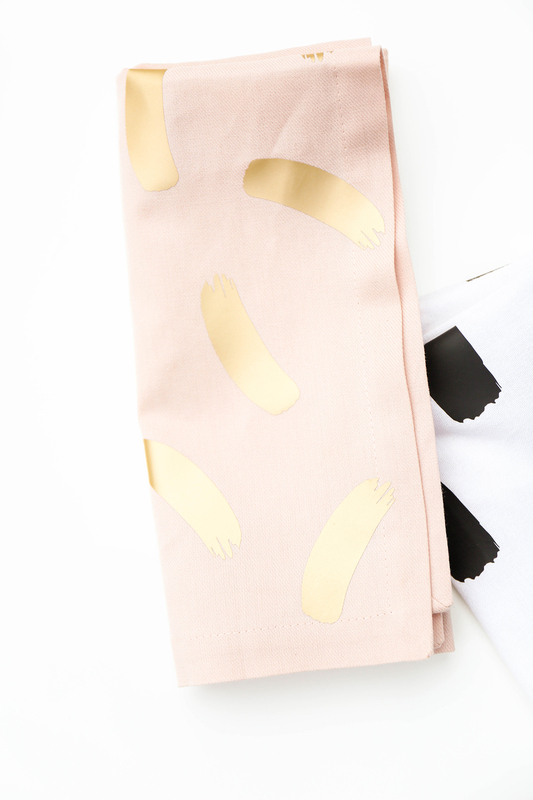 Hooray for the simple iron-on projects that make life go ’round. After I was done pressing, I let the shapes cool for about 30 seconds or so (probably much faster. See why I need a timer?) 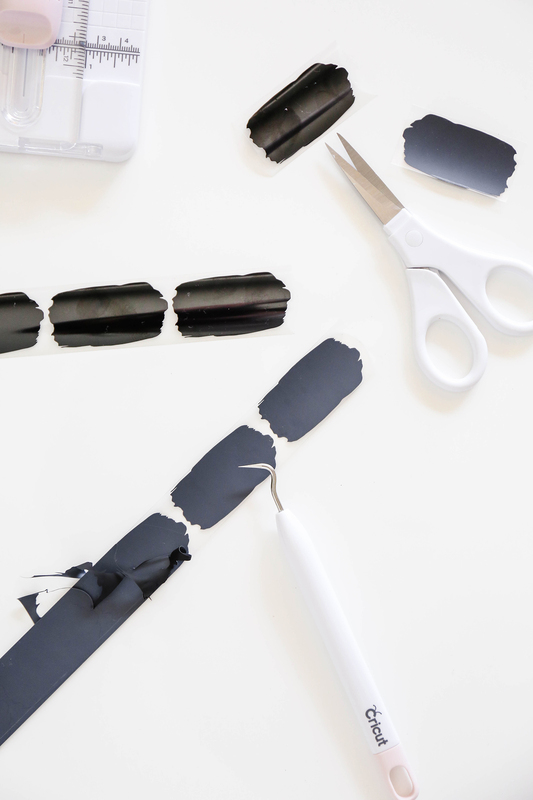 and then peeled away the liner. Vita thought this was the coolest part because she kept trying to peel away the actual designs, and they wouldn’t budge! Boom. And now I’m hooked. 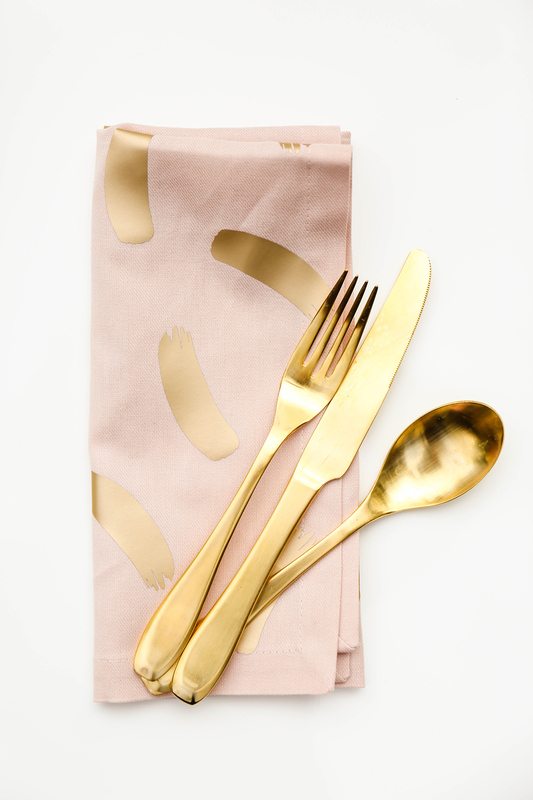 After playing around with some solid black iron-on material, I whipped out the gold everyday iron-on material for a little pink napkin action and I am really in love with how this one turned out! 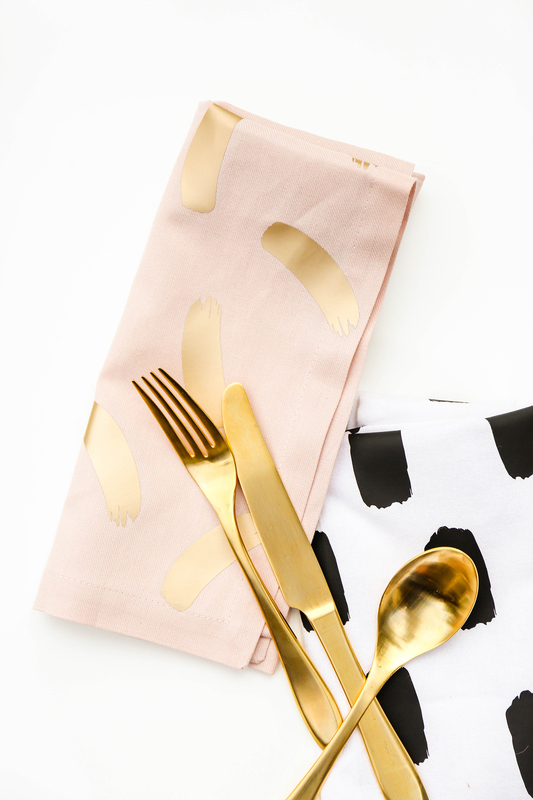 These DIY abstract napkins have already been put through a wash-cycle and still look brand new once I go over them with the press to remove any wrinkles! I press the back side so I don’t chance melting the iron-on material. I think the key to successful iron-projects is using a flat surface and taking your time. The EasyPress 2 distributes the heat evenly so you can work in sections and know that each piece of the design will adhere as it should. This project is simple enough that you don’t need to rush it, but by being slow and steady each step of the way really helped these look their best! 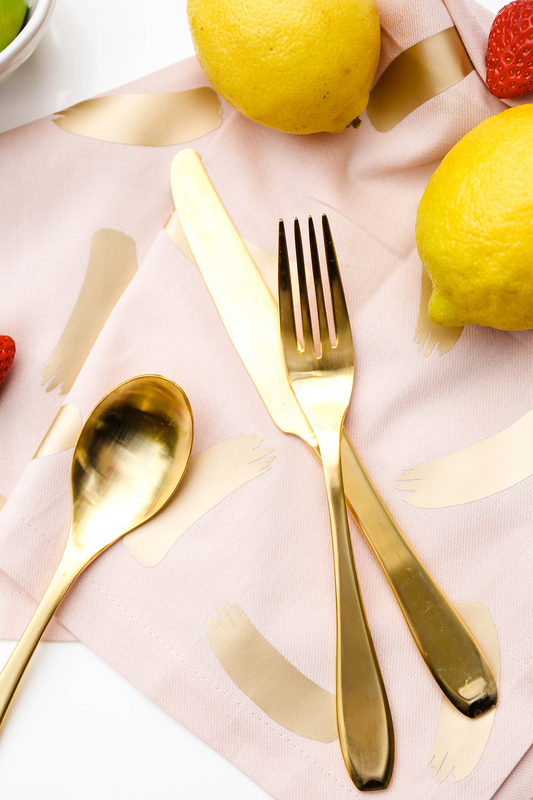 Now, who wants a set of these DIY abstract napkins for their birthday? Or just because it’s Tuesday? I’m feeling generous and gifty! 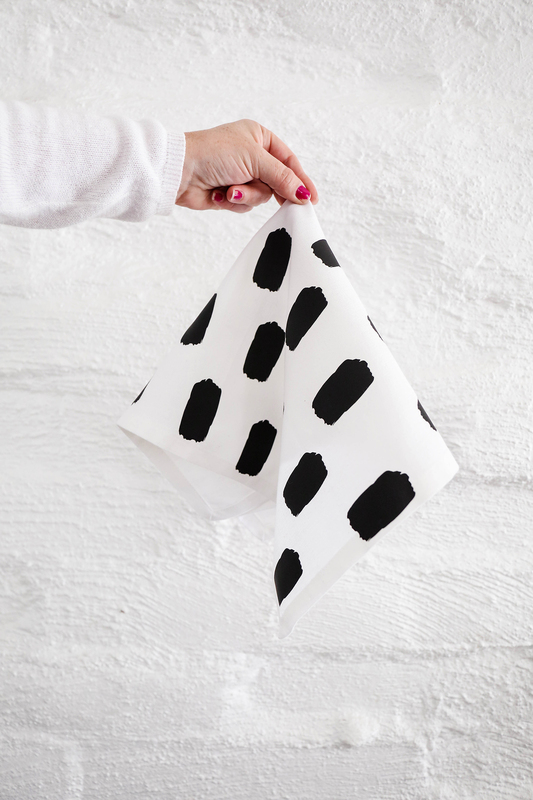 If you want to make your own, you can download these shapes right here to use for your own iron-on projects! And if you want to see more about Cricut’s newest Maker, check out my last post! Or just head right here to read about all of their latest products! **This is a sponsored conversation written by me on behalf of Cricut. The opinions and text are all mine. Thank you for supporting the brands that help PROPER keep making! So cute! Could you link to the napkins? Love the color.